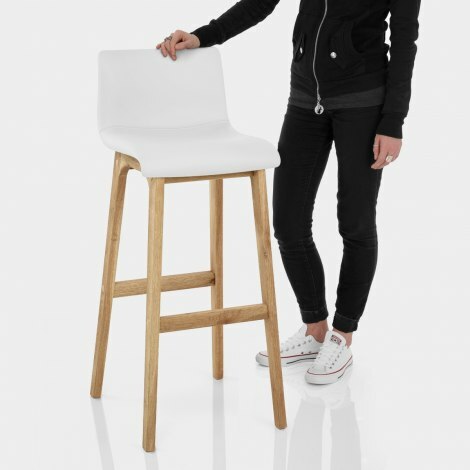 Let the chic styling of the Wave Bar Stool White bring a contemporary feel to your interior, whether it is old or new. An exclusive modern design with a retro flair and reliable design, the Wave Bar Stool is sure to update and enhance your home. 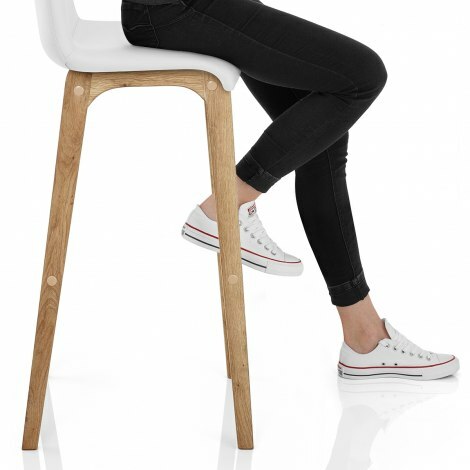 Ergonomically curved to provide quality comfort, the padded seat is upholstered with crisp white faux leather. It also features a medium height backrest to offer generous support. Offering a natural contrast to the seat, the four-legged frame is crafted from solid oak and includes bracing bars for strength and stability. Ideal for your kitchen or breakfast bar, it is fixed at standard worktop height and suits a variety of décor styles. "Look far more expensive than they were"
Pleased with the stools, easy to assemble. Good quality product at a reasonable price and good service. No complaints about product or company. I absolutely love these stools as does everyone who sees them. Ordered one day, delivered the next a for free! Super easy to assemble in less than 5 minutes and they look so good. And look far more expensive than they were. Would totally recommend and will certainly order other items from Atlantic. Thanks Atlantic - awesome product and great service.